The Pacific Beach/Taylor Library is one of 35 branches of the San Diego Public Library. Staffed by 4 full-time, 11 part-time, and numerous volunteer workers, the Library provides a wide range of services to the community. Manuel Oncina, the architect, designed the building to resemble the shape of a nautilus shell. While the shell motif is best seen from overhead, the open design of the building and the many windows that let in sunlight create an organic feel that ties in with the natural beauty of this beach community. Nestled against the Taylor Greene, a park just east of the library that completes the rest of the city block, the Library is a welcoming destination point. The library may be entered either from its main entrance facing Cass Street, or a second entrance that faces Dawes and is adjacent to the Library's Reed Avenue parking lot. 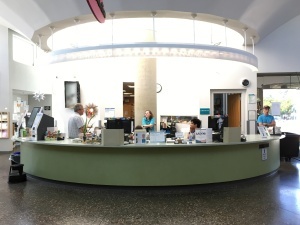 Both entrances open toward the Library's large circulation desk, including two Express Check terminals for convenient check-out. Book shelves displaying items for shoppers from the PB Friends Book Sale are located in front of the Circulation Desk adjacent to the Reed Avenue entrance to the library. West of the Circulation Desk, just past the Reed Avenue entrance, is an alcove that includes a community bulletin board, and a display of free materials. Further down that hallway are the public restrooms and the Meeting Room/Gallery. 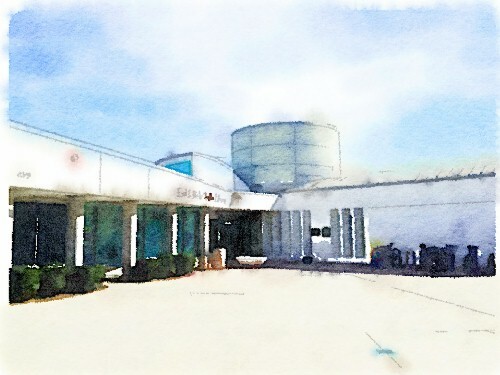 Computer catalogs in the Library provide up-to-date access to the San Diego Public Library system holdings as well as information about resources at public and academic libraries located throughout San Diego County. In addition to searching for library books, SDPL library card holders may use the online catalog (www.sandiegolibrary.org) to access the library's databases or download eAudiobooks and eBooks to their home computers. The Audio-Visual section of the library features films on DVD as well as audiobooks on CD and MP3. Adjacent to it is the library's Reading Area, featuring our Magazine and Newspaper collections. As a courtesy to other library users, we request that this area be respected as a Quiet Area. The Reference Desk is located immediately east of the Reading Area. The public computer area is located just beyond the Reference Desk. Along the glass wall that faces Thomas Avenue are 10 Internet-connected computers; 6 additional Internet-connected computers are located nearby on red tables. All 16 computers are available for use with a San Diego Public Library card for 60 minute turns. If all computers are in use, you may reserve the next available computer at the PC Reservation station, located next to the Catalog computers. Library cards are free for all California residents with photo identification and address verification. Internet-Only cards are available for non-residents with photo identification. The library is also equipped with free Wi-Fi access to the Internet, to which patrons can connect with their personal devices. The network is named SD Library Wifi, and that month's password may be obtained from any library staff member. Between the Circulation Desk and the public computer area lie the New Books, Large Print, and Spanish language collections. The Adult Fiction, biography, and non-fiction collections stretch across the stacks from the Reference Area to the Children's Area. The non-fiction and biography collections have all of the reading levels (Juvenile, Young Adult, and Adult) interfiled. The Adult Fiction collection similarly has genres interfiled, so that all of the books by a single author who writes Mysteries, Westerns and general Fiction would all be found together. Holds are located on the low shelves between the catalog computers and the New books. The Children's Area houses books, paperbacks, magazines, audiobooks, and DVDs for children. The Story Corner features soft toys and cushions for families wishing to read together. The Children's Area also includes 3 Internet-connected computers for students to either do homework or play games. The Friends of the Library room is only open to the public during the hours of the outdoor Book Sale, on Mondays, Wednesdays, and Saturdays. The room opens to the exterior plaza facing Cass Street, under an awning that is shared by an entrance to the Meeting Room/Gallery. The Library's landscaped plaza is a wide open space with a few stone seats and many more trees to rest beneath. The Book Sale is held just outside the Friends Room every Monday, Wednesday, and Saturday, and the plaza occasionally plays host to concerts and dance programs during the summer months. The names of library donors are inscribed on pavers in the courtyard, as well as inside the library. The Meeting Room, which holds up to 95 people for group programs and events, features a Steinway grand piano purchased by the Friends, a retractable projection screen, and a kitchen for simple food service. Meeting rooms can be reserved online; (==> Click Here <==) to do so. The Meeting Room also serves as a Gallery, and features art exhibitions that rotate every 6-8 weeks. The Taylor Gallery is known for exhibiting museum-caliber art by a variety of San Diego artists. We hope that you enjoy your visit to the Pacific Beach/Taylor Branch Library. We are looking forward to seeing you here often!